How can we receive the peace of God amidst a world full of turmoil? If we seek the peace that the world offers, then it’s not the peace that is permanent, because in this tumultuous world, peace comes and goes like waves crashing onto the shore. There might be temporary truces between nations, but the time always comes when war breaks out and the peace is lost. Peace talks, peace keepers, and peaceful co-existence sound good, but they never really last. What we need is a peace that is beyond human ability; a peace that settles within the human heart and gives the person a feeling of security and calmness; a peace that shows up in our lives even when the world around us is falling apart and growing ever increasingly violent. That kind of peace doesn’t come from mankind. And the peace the world offers is not enough. We need the peace of God and a peace that transcends human understanding and looks beyond what is happening around us today. The Bible teaches there is no peace for the wicked because they have not known the way to peace (Isaiah 48:22). There is a peace available that is permanent and does lasts forever, but you won’t find it in this world…we must look elsewhere…and this type of permanent peace is found only in the Word of God and in the God of the Word. When mankind has proven beyond a shadow of a doubt that they can never bring world peace, we must look to Someone Who can bring this peace and it must come by the strength of God alone. The psalmist wrote of God, “You have a mighty arm; strong is your hand, high your right hand” (Psalm 89:13), however, if anyone opposes God, He thunders from heaven, “I myself will fight against you with outstretched hand and strong arm, in anger and in fury and in great wrath” (Jer 21:5). God gives everyone a choice today, before Christ’s return when salvation is open for all (2nd Cor 6:2), so today, the Lord is still saying, “Behold, I set before you the way of life and the way of death” (Jer 21:8). The greatest weapon Satan has is procrastination. If he or his minions can persuade someone to keep putting off their decision for Christ, the day will come when Christ returns or that person dies, and then comes the judgment of God (Heb 9:27; Rev 20:12-15). Even after a stubborn mankind clearly knows that God exists (Rom 1:18-20), but they choose their sin over the Savior, so Christ will come to rule the world with a rod of iron, meaning He will rule His kingdom spiritually but also physically. Ezekiel the Prophet reminds us of His strength in dealing with rebellious nations, saying, “I am against Pharaoh king of Egypt and will break his arms, both the strong arm and the one that was broken, and I will make the sword fall from his hand” (Ezk 30:22). Jesus Christ Himself tells John to write down the fact that he “will rule them with a rod of iron, as when earthen pots are broken in pieces, even as I myself have received authority from my Father” (Rev 2:27), and in His righteous judgment, “From his mouth comes a sharp sword with which to strike down the nations, and he will rule them with a rod of iron. He will tread the winepress of the fury of the wrath of God the Almighty” (Rev 19:5). The point being; only God, and specifically Jesus, can bring peace, both to the world, and to us personally. Did you know that you cannot have the peace of God until you are first at peace with God? Until we are brought to repentance and faith, we are enemies of God (Rom 5:10). Our natural minds cannot even comprehend the things of God, so “the mind that is set on the flesh is hostile to God, for it does not submit to God’s law; indeed, it cannot” (Rom 8:7). This is why God has to quicken us or make us alive in Christ because we were dead in our sins (Eph 2:1), and dead people cannot even know God in a personal way. It took the power of God to make us into new creations in Christ (2nd Cor 5:17), so that we’ll be receptive of His Word. So until we are at peace with God, we can never have the peace of God. 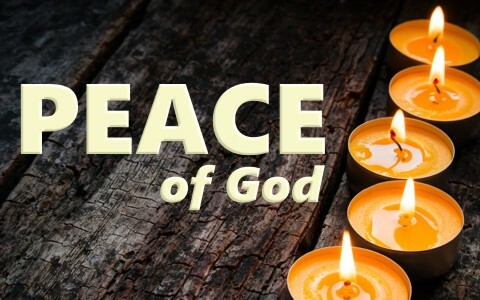 The Apostle Paul wrote, “since we have been justified by faith, we have peace with God through our Lord Jesus Christ” (Rom 5:1), and this kind of peace is “the peace of God, which surpasses all understanding, will guard your hearts and your minds in Christ Jesus” (Phil 7). This same peace should act as a unifying glue that holds the church together in unity, and why we should be “eager to maintain the unity of the Spirit in the bond of peace” (Eph 4:3), and since “he himself is our peace, who has made us both one and has broken down in his flesh the dividing wall of hostility” (Eph 2:14), we should be seeking peace and pursue it at all times. Besides, Jesus promised, “Blessed are the peacemakers, for they shall be called sons of God” (Matt 5:9). The disciples were deeply troubled by Jesus saying He was going away, and probably fearful that He had told them what He was going to do, so Jesus promised His disciples peace before He left, and this was at a time when they had little or no peace. Jesus told them (and us), “Peace I leave with you; my peace I give to you. Not as the world gives do I give to you. Let not your hearts be troubled, neither let them be afraid” (John 14:27). What Jesus gives, He does not take back, and the peace He gives is permanent. Will we embrace it? Will we believe His Words? But some will say, “How can you have peace in a world that seems anything but peaceful? How can we have peace when our finances, health, relationships, and just about everything else seems to be falling in on us?” The peace of God transcends this and is not dependent upon circumstances, because no circumstance or power in heaven or hell can keep you from God, and that ought to give you peace like you’ve never had before. Paul adds, “There is therefore now no condemnation for those who are in Christ Jesus” (Rom 8:1), and because there is no condemnation, we have peace with God and the peace of God, and even more, “neither death nor life, nor angels nor rulers, nor things present nor things to come, nor powers, nor height nor depth, nor anything else in all creation, will be able to separate us from the love of God in Christ Jesus our Lord” (Rom 8:38-39). Next post: How Should Christians Respond To Bullying?